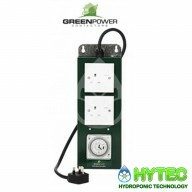 5 way Hobby Relay timer The Green Power 5 way Hobby Relay timer is great for two light grow rooms with limited mains power sockets and a maximum input load of 1200 watt. 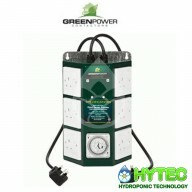 The 5 way Relay Timer has five sockets, designed to give the grower one point for all his electrical appliances, this unit has ..
2 way Professional Contactor timer The Green Power 2 way Professional contactor timer is perfect for a two light grow room with limited mains power sockets and a maximum input load of 2000 watt. These units utilise a heavy duty professional contactor and a professional grasslin timer. 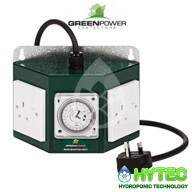 The 2 way ..
4 way Professional Contactor timer The Green Power 4 way Professional contactor timer is ideal for four light grow rooms with a maximum input load of 4000 watt. These UK built units utilise a heavy duty professional contactor and a professional reliable grasslin timer. 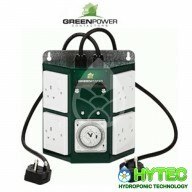 The 4 way contactor timer ..
6 way Professional Contactor timer The Green Power 6 way Professional contactor timer is perfect for a six light grow room with a maximum input load of 4000 watts. These units utilise a heavy duty professional contactor and a professional grasslin timer. 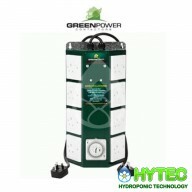 The 6 way contactor timer has a handy bui..
8 way Professional Contactor timer The Green Power 8 way Professional contactor timer is perfect for an eight light grow room with a maximum input load of 4200 watt. These units utilise a heavy duty professional contactor and a professional grasslin timer. The 8 way contactor timer has a handy b..
2 way Hobby Relay The Green Power Hobby 2 way relay unit is ideal for the smaller scale plant grower wanting to protect against electrical surges and accidental over-load. 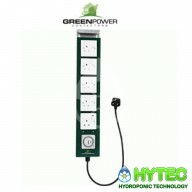 These units are manufactured to the highest British safety standards; they are made from quality components as all Green Powe..
Green Power Commercial 12-Way + 4 Non-Timed Sockets Contactor Grow Light Controller The Green Power Commercial Contactor for controlling multiple banks of HID lights, 12 light version. 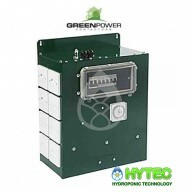 These units send power to your HID lighting ballast bank-by-bank, reducing the surge you get from HID l..
Green Power Commercial 16-Way Contactor Grow Light Controller The Green Power Commercial Contactor for controlling multiple banks of HID lights, 16 light version. These units send power to your HID lighting ballast bank-by-bank, reducing the surge you get from HID lights on start up. 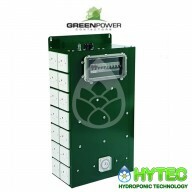 Gre..
Green Power Commercial 28-Way Contactor Grow Light Controller The Green Power Commercial Contactor for controlling multiple banks of HID lights, 28 light version. These units send power to your HID lighting ballast bank-by-bank, reducing the surge you get from HID lights on start up. Green Pow..